A small team of researchers exploring and monitoring sea life along the eastern seaboard stumbled upon the rarest of finds last week: one teed off mollusk. Jerry the Clam discusses his challenges. According to the team leader, Dai Ver, the clam caught their attention because he was perched alone on the top of a large boulder. 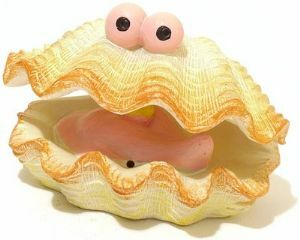 Our news team had a chance to sit down and talk with Jerry the Clam and ask him why he was so perturbed. “Not everybody fits into your neat little stereotypes, you know,” Jerry answered. “Other clams are always coming up to me saying, ‘Hey Jerry! Turn that frown upside down!’ and ‘Make your Monday a Funday, Jerry.’ I tell you what, if I have to hear one more mollusk tell me to turn all my ‘sand’ into ‘pearls’, I’m gonna punch them in the face,” he added. As the golden sun sank over the horizon in the distance, you could hear the seagulls calling out to each other, waves crashing on the nearby shore, and a tiny clam cursing like a sailor in the wind.